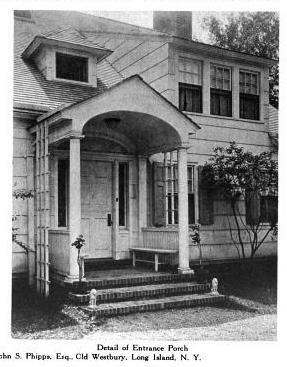 A house on the grounds of 'Westbury House' owned by John S. Phipps and altered by Peabody, Wilson & Brown c. 1918 in Old Westbury. 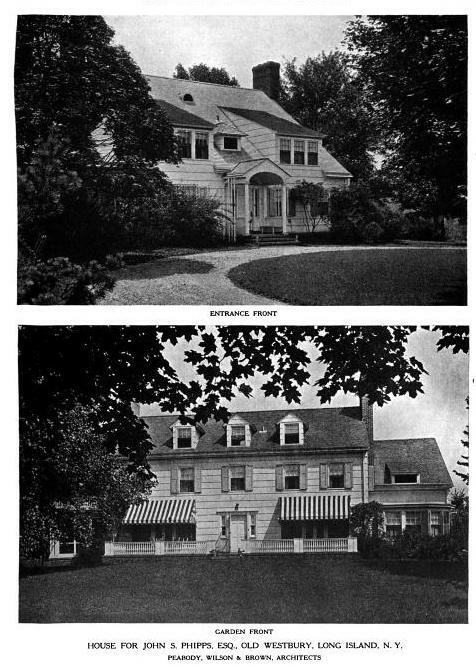 This was formerly the estate of William E. Hawxhurst (b. 1838), descendent of Christopher Hawxhurst, one of Oyster Bay's first settlers and largest land owners. 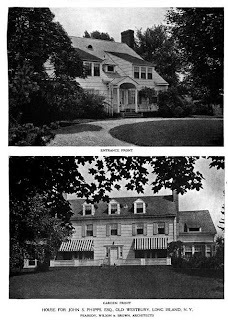 William's son Harold's 1947 NYTimes obituary mentioned that William was at one time owner of much of the land that became Westbury and Old Westbury. William Hawxhurst died in 1908 and his wife Marianna Hicks Hawxhurst (daughter of Isaac Hicks) in 1915. Phipps purchased and incorporated the property into his estate at that time. In typical Peabody, Wilson & Brown fashion they altered and enlarged the Hawxhurst's c. 18th century Quaker farmhouse into what is seen here. Click HERE to see this residence on google earth and HERE on bing. Very civilized. But then, it is Peabody Wilson & Brown. It's in Old Westbury? It's 18th century? So when is the place going to be torn down? Believe it or not the property already has an approved subdivision plan. Hopefully whoever owns it will think twice and sell it to someone who cares more about its history than its income potential. "Hopefully whoever owns it will think twice and sell it to someone who cares more about its history than its income potential"
Unfortunately it doesnt sound promising at all. Hahahahahaha---or even someone who cares more about having an attractive house than a dryvit mcmansion. John S. Phipps did appear to have an appreciation for historic architecture. 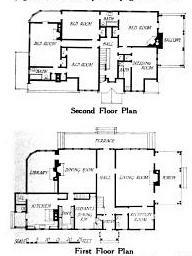 From 1924 to 1929 he enlarged the manor, rennovated structures, added a stable and commenced a considerable landscape push that pays off today. Son Hubert inherited it in 1957 upon John's death. No longer Phipps owned it is still an exceedingly beautiful private estate. No way the Virginia property will in danger of being razed. As I wandered lonely as a cloud on Bing I've often wondered about this house. Thank you for the post. What understated, spacious grounds. The proximity of a service or farm compound makes me wonder if it was intended as an agent's or manager's residence, rather than subsidiary family quarters - suitable though it would be for either purpose! Oh, please, no clutch of wannabes with their backs to one another on that lawn stretching to the pond. 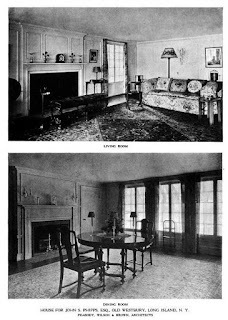 ^ Westbury House's superintendent lived off of Jericho Turnpike in a James O'Connor designed residence. This easily could have been for the head gardener or butler or head groom. I will ask someone at OWG and see if they know. Uh uh. I'm betting far more likely for one of the children or guests, or a family friend. 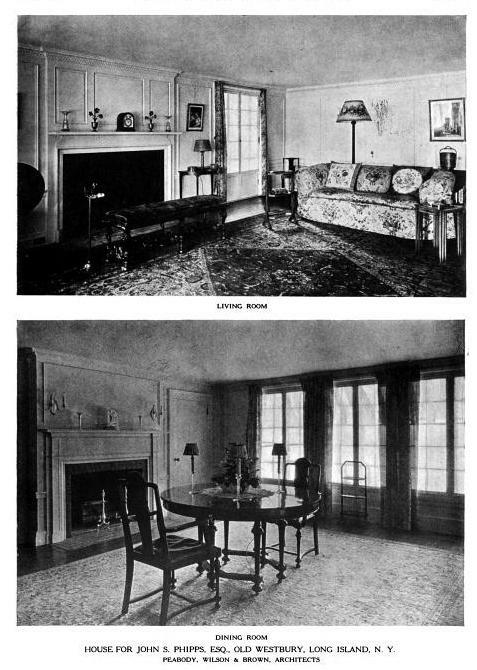 This is above even top level servant grade---and has a servant's dining room. You know I had thought of that but Peggie had Orchard Hill and Michael lived in a house along the service road... that would leave Ben and Hubert. Ben would have been 14 in 1918 and Hubert 13 (Peggie would have been 12 and Michael 7). Jay could have been planning for the future. While there were roughly 40+ employees living on and around the estate, the Stud Groom, Joseph Quinn, had a huge family (1 son and 5 daughters aged 14 and under in 1910). Just a possibility. Or perhaps Phipps just restored it because it gave him pleasure to restore an old house on the property---it used to be often done, before the teardownitis virus infected America. Though DED's logic is impeccable, (why should today be different from any other day? ), to restore an old house on the property as a picturesque feature of the landscape is one thing; to furnish and photograph it may be another. In the absence of direct evidence of either family or guest occupancy I'd say it could have been one or the other. Don't forget it was often necessary to go to some lengths to attract qualified upper servants after WWI, and providing staff for staff is certainly not unheard of, though few families went to the lengths of the Vanderbilts to let the world know even their butlers had butlers. I had the pleasure of working and living on this magnificent estate, the architecture is breathtaking! would be a very sad day indeed, if it were no more!